Our range of green PET plastic bottles offer a unique and durable packaging solution. 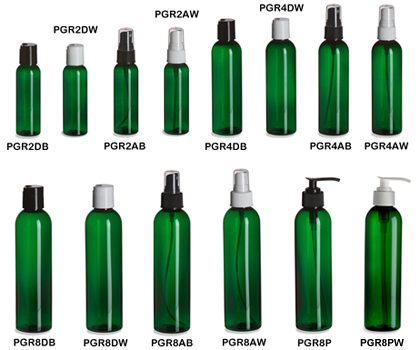 Made in the USA, these food grade plastic bottles are ideal for natural body and hair care, or green cleaning products. We offer pumps, sprays, or disc caps in either black or white for a convenient and attractive finished product. All prices include applicable closure.